The team was caught in a deadly ambush that not only threatened their lives, but the entire mission. The elite soldiers fought huddled for hours on a small rock ledge as rocket-propelled grenades and heavy machine-gun fire rained down on them. With total disregard for their own safety, they tended to their wounded and kept fighting to stay alive. When the battle finally ended, ten soldiers had earned Silver Stars—the Army’s third highest award for combat valor. It was the most Silver Stars awarded to any unit in one battle since Vietnam. 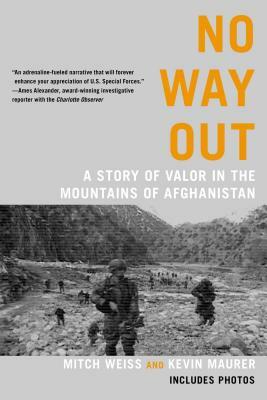 Based on dozens of interviews with those who were there, No Way Out is a compelling narrative of an epic battle that not only tested the soldiers’ mettle but serves as a cautionary tale. Be careful what you ask a soldier to do because they will die trying to accomplish their mission. Mitch Weiss is a Pulitzer Prize-winning investigative journalist for the Associated Press. In 2003, he was assigned to an investigative series that uncovered the longest string of atrocities carried out by a U.S. fighting unit in the Vietnam War. In recognition of the series “Buried Secrets, Brutal Truths,” which led to an investigation by the Pentagon, he was awarded the 2004 Pulitzer Prize for investigative reporting. Weiss currently works for the AP on investigative projects, and an investigative series he wrote about corrupt real estate appraisers won several national awards in 2009. He also was part of a team of AP reporters that won a George Polk Award in 2010 for their coverage of the British Petroleum oil spill disaster in the Gulf of Mexico. Kevin Maurer has covered special operations forces for eight years. He has been embedded with the U.S. Special Forces in Afghanistan six times in the last five years and spent ten weeks with a team of Green Berets in Afghanistan in 2010. He has embedded with American soldiers in Iraq, east Africa and Haiti. The author of four books, he co-wrote a memoir of a Korean War veteran, a book about the 2006 Battle of Sperwan Ghar, and is the co-author of No Easy Day: The Firsthand Account of the Mission That Killed Osama Bin Laden.